I ridiculed the silliness of some aspects of libertarian thought in an earlier post, and planned to offer some balance by noting that their inherent suspicion-of-authority has played a big role in raising awareness of the financial crimes and improprieties of recent years. Alpha-dog libertarians are a bit like moneyed anarchists — since “the system” has worked well for them, they don’t actually want to destroy the state. Just neuter it. ;) Anyways, their pecuniary acumen seems to give them a sharklike sense for financial corruption. Paul ran for the leadership of the Republican Party in 2008, unleashing zingers like the following at the debates. Astonishingly enough, these soundbites earned him rousing cheers from the audience… of Bill Maher’s left-leaning “Real Time” talk show. At the debate, all he got was silence of the “chirping crickets” variety. And sadly, he was barred from participating in later debates by the party’s insiders, the only upside of which was web footage of FOX commentator Sean Hannity running away from an angry mob of Ron Paul supporters, outside one of the debates he’d been excluded from. 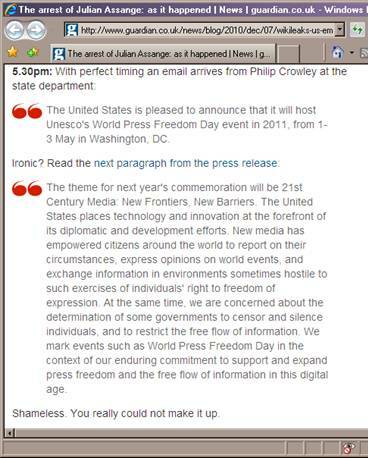 In other news, the WikiLeaks-hunting US State Department (the Jalvert to WikiLeaks’ Jean Valjean) yesterday announced that it was pleased to host Unesco’s World Press Freedom Day in 2011. No doubt attendees will be interested to see how the US is “…concerned about the determination of some governments to censor and silence individuals, and to restrict the free flow of information”and how they plan to keep their “enduring commitment to support and expand press freedom and the free flow of information in this digital age”. Here’s a screen-capture of the Guardian’s live feed of Julian Assange’s arrest back in 2010.